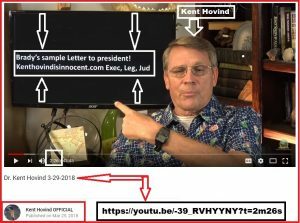 Kent Hovind to President Trump! – Kent Hovind v. Robert Baty – The Great Debates! Home→Kent Hovind to President Trump! 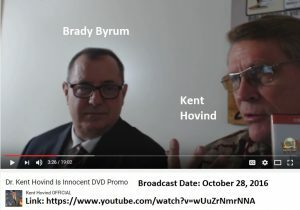 In recent performances, Kent Hovind has been promoting a pro-forma letter to President Trump, on his behalf, as crafted by his legal dream team leader and sovereign citizen promoter Brady Byrum. For some time, Kent has been referring his supporters to the KentHovindIsInnocent.com website in order to find the form letter to use to write President Trump on his behalf; for a pardon of his 2006 convictions. Today, March 29, 2018, Brady finally got the form letter conspicuously posted to that website. Thank you so much for putting your Real Estate business on hold while you try to steer America back from the brink of disaster. Up front, I want you to know that I believe in you, and that I support you in your efforts to make America great again. Part of that process involves addressing wrongs that were committed prior to your arrival in office. While I know you will not be able to right every wrong, solve every problem or reverse every injustice, I am writing to you today for one specific injustice that MUST be addressed and reversed. There was a man and woman, then husband and wife, who were maliciously prosecuted and wrongfully convicted, eleven years ago, by a team of overzealous IRS Agents and Federal Prosecutors. That man is Kent Hovind. I have learned of a man, Brady Byrum, who is a Paralegal Researcher. After over one year of research, and many hundreds of hours he spent intently reading thousands of pages of Federal case laws, Statutes and Regulations and IRS Manuals, Brady found that Kent and Jo Hovind committed NO CRIMES. In the first six of the eight videos, he laid out the law, the case law, and the Internal Revenue Service’s own manuals showing exactly how and why Kent and Jo were completely innocent of all charges. Kent’s then-wife Jo was falsely convicted of one charge, and she served almost one year in Federal Prison for nothing more than making the deposits into and withdrawals from their bank account. Jo divorced Kent after he got out. First, it is my request that you have one of your aides immediately check into Brady’s research on this fraudulent prosecution and the false convictions on 58 counts against Kent, verify his findings, and once they report back to you, please give this Christian Evangelist the PRESIDENTIAL PARDON that he so truly deserves. I beg of you Sir, please have one of your aides validate what Brady has documented, especially what he found in the Reinis and Anzalone cases (quoted further in), and when verified, please grant Kent (and Jo) Hovind a full Pardon. Second, I want Kent Hovind to get ALL of that unlawfully seized ministry property and all of the donated cash back immediately. Within the last few years, the IRS has been forced to DISGORGE MILLIONS OF DOLLARS back to the numerous people and businesses that they had unlawfully STOLEN the funds from, and return unlawfully seized property, that had been taken because the victims had committed the “NON-CRIME” of making multiple DEPOSITS and WITHDRAWALS in their bank accounts that were NEAR $10,000 after their business (or Ministry – like in this case), had grown and reached that level of customary transactions. Businesses and Ministries are NOT committing crimes in their banking deposits and withdrawals, simply because they have grown to that particular level. Please contact the Commissioner of the Internal Revenue Service and the D.O.J. and ORDER them to reverse the ministry land seizure and completely DISGORGE all of the stolen funds, with eleven years interest, back to Kent Hovind. Third, PLEASE order the I.R.S. and the D.O.J. 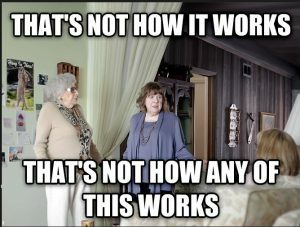 to stop prosecuting people for the false charge of “STRUCTURING”, because Brady found in U.S. Federal Court’s own rulings, that there is NO SUCH THING. Please allow me to explain what he found. Brady found that the charge of “Structuring” is actually only a ruse to enable an out of control “fed-train” to selectively destroy whomever they want, whenever they want, for doing legal acts, that is, making deposits in and withdrawing money from their own bank account. There should be NO ROOM for selective persecution of Americans. After Brady read every word of those Anzalone, Reinis, Richter and the other associated cases documented in his research, several times, the clarity of the fraud of prosecuting “structuring” surfaced, and he thoroughly documented it. What becomes manifestly clear is that there simply is no crime of “Structuring” because the IRS never obeyed the Federal Law, (the Administrative Procedures Act, found in 5 USC 551 – 559), in the first place, and they failed to properly enact the document form. As such, the 4789 (now administratively renamed the 104), has NEVER BEEN mandatory and has always been voluntary to complete and turn in to the IRS. To this day, it is still only voluntary to file, regardless of who “believes” otherwise. The end result is such that ALL prosecutions and all convictions for “structuring”, past, present and even those charges that may right now be pending against people today, have always been, since the early 1970’s and until even today, continue to be FALSE. If people are arrested and prosecuted for real crimes like “human trafficking”, and are also accused of “Structuring” by them depositing or withdrawing bank funds near $10,000, then the “structuring” was and is used to enhance the other sentence. But when someone like Kent, (who didn’t violate any laws to begin with – as Brady has proven in his expose), is persecuted this way, it is used as a persecution bully tactic, like a club, to enhance false charges into lengthier sentences that were not deserved at all. Brady’s PROOF OF THE ILLEGALITY TO PROSECUTING STRUCTURING IS FOUND FIRST IN U.S. v. ANZALONE, 766 F.2d. 676, (1st Cir. 1985). “Consequently, Form 4789 is not effective as a regulation.” See United States v. $200,000 in United States Currency, 590 F.Supp. 866 (S.D.Fla.1984). “Criminal penalties for failure to report currency transactions can attach only upon violation of regulations promulgated by the Secretary.” See California Bankers Association v. Shultz, 416 U.S. 21, 26, 94 S.Ct. 1494, 1500, 39 L.Ed.2d 812 (1974). These rulings were all made YEARS BEFORE Kent was persecuted and prosecuted, so these irrefutable facts COULD HAVE and SHOULD HAVE blocked the 45 false charges of structuring, but the Prosecution and the Judge ignored them and attacked them both anyway. Brady found that the 45 false charges of Structuring were used to enhance the false allegations of the 12 counts of “Failure to Withhold and Pay over Tax” when in fact he found that Kent did not owe that tax in the first place, by being a minister operating a ministry. Brady’s Video Number 3 ABSOLUTELY PROVES Kent owed no tax and owed no obligation to file any IRS forms. The C.S.E. Ministry was not an average, customary CHURCH, however the 12 point CRITERIA or “policy” of what is “commonly recognized to constitute a church” IS NOT LAW. There is NO LAW that requires a Ministry to have a CHURCH BUILDING and hold WEEKLY SERVICES. Most do, but NOT ALL, and it is a First Amendment violation to try to FORCE ALL Ministries into only one model. Kent is an Evangelist, who, eleven years ago, regularly traveled 200+ days per year, speaking hundreds of times in hundreds of churches to tens of thousands of people across America and in foreign countries every year. Many Evangelists routinely do NOT have their own “church building” but instead speak at other congregation’s buildings, but they are nonetheless, ministers by every proper definition. Lastly, Brady found that the one count filed against Kent of “Interfering with an Agent” was also malicious prosecution, because his detailed analysis of the wording of the law shows that it was improperly used against Kent, being written explicitly for Tobacco Inspectors in Tobacco Manufacturing, Importation, Exportation Company Facilities and Customs Inspection Buildings where imported Tobacco has arrived into the United States or exported Tobacco is about to leave the United States. Brady proved in his Video Numbers 5 and 6 that there was no agent “interfered” with. All of this can be verified and has been documented and catalogued for easy access. Kent Hovind and his then wife Jo, were wrongfully targeted and raided by the I.R.S and A.T.F. SWAT TEAM like terrorists, when they committed no crimes. Thank you for your time and consideration, and may God bless you and your efforts to restore America to its former glory.